An app designed to help plaintiffs’ attorneys better track the day to day emotional distress of their clients and quantify it for trial has launched, the first of its kind. Damages Genie was designed by Los Angeles trial attorney Genie Harrison and her husband, graphic designer James Lizardi. 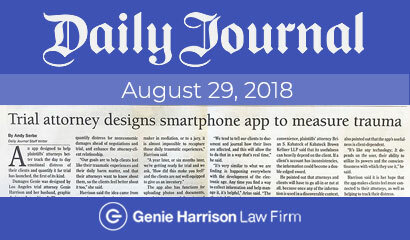 The smartphone app gives plaintiffs a way to describe how they feel, log missed events due to emotional trauma, and keep a journal to be shared with their attorneys. Harrison said the app will streamline attorney communication with clients, give them a simpler way to quantify distress for noneconomic damages ahead of negotiations and trial, and enhance the attorney-client relationship. “Our goals are to help clients feel like their traumatic experiences and their daily harm matter, and that their attorneys want to know about them, so the clients feel better about it too,” she said. Harrison said the idea came from recurring questions from attorneys under her tutelage about the difficulty of presenting emotional distress to justify noneconomic damages. “It’s the nature of trauma that we try to move on and wake up the next day, and compartmentalize how we felt the previous day. If we have to go and tell those stories to a decision maker in mediation, or to a jury, it is almost impossible to recapture those daily traumatic experiences,” Harrison said. The app also has functions for uploading photos and documents, a scale to measure daily pain, and individually tracks each factor so it can be easily visualized in a graph or chart for use. Plaintiffs’ attorney Mike Arias of Arias Sanguinetti Wang & Torrijos LLP said the app’s in-the-moment distress tracking is one of the most intriguing components. “We tend to tell our clients to document and journal how their lives are affected, and this will allow the client to do that in a way that’s real time,” he said. Arias is president of the Consumer Attorneys Association of Los Angeles and president-elect of the Consumer Attorneys of California. While the app presents increased convenience, plaintiffs’ attorney Brian S. Kabateck of Kabateck Brown Kellner LLP said that its usefulness can heavily depend on the client. If a client’s account has inconsistencies, the information could become a double-edged sword. He pointed out that attorneys and clients will have to go all-in or not at all, because once any of the information is used in a discoverable context, that decision cannot be retracted. From a diligence standpoint, Arias also pointed out that the app’s usefulness is client-dependent. “It’s like any technology; It depends on the user, their ability to utilize its powers and the conscientiousness with which they use it,” he said. Harrison said it is her hope that the app makes clients fell more connected to their attorneys, as well as helping to track their distress. “I want to be part of having people think more positively about lawyers, and I want to help as many people as I possibly can whether it’s other attorneys’ clients or the attorneys themselves,” she said.